A modular 2-step binocular microscope with a superb Greenough optical system, sturdy coarse focusing controls, and ergonomic magnification toggle controls ensure the ultimate in performance and ergonomy. The Luxeo 2S can be ordered with either a 1X/3X or 2X/4X magnification barrel. Wide field focusable 10x/18mm eyepieces provide a large, crisp field of view. Anti-microbial paint and surface treatment promise users bacteria-free contact surfaces. An integrated 10-LED ring light with a 3-LED base glow screen provide cool, white light for extended periods of use with minimal bulb-change required. With a + / - 30̊ angle of incidence controlled through three unique light settings, surface glare can be minimized with a simple push of a button. A light-intensity control dial conveniently located within the ring-light construct allows users further control over the amount and quality of incident light illuminating items of interest. 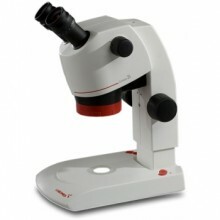 Click the button below to add the Labomed Luxeo 2S Stereo Microscope to your wish list.